Calcudoku is one of the many names for a puzzle that combines more than just the addition regions familiar from killer sudoku, but also combines the other mathematical operations: that is: subtraction, multiplication and division. 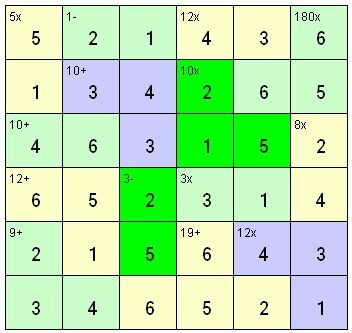 There is one other key rule change in calcudoku, in that you may repeat a number within a coloured region (the set of cells that make up each sum). However, you must not repeat in a row or column, as familiar from normal sudoku. 100 Calcudoku If you are logged in to your account, click the links below to play any of a 100 calcudoku puzzles; we hope you enjoy them!